Hang on to belt and leg loops and step thru. Black diamond harnesses have a loop on the side of the belt to put the loose end thru. Tie a figure 8 knot about 2 1/2 feet from the end of the rope. or if no loops, thread it behind the harness waist belt and strap that joins the leg loops. 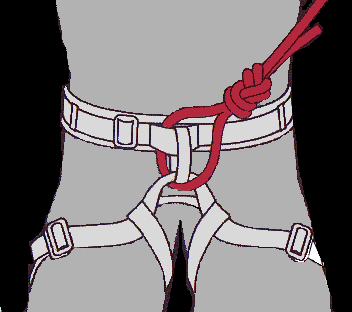 See the manufacturer's tie-in instructions for your harness. Trace the end of rope back along the exact path of the figure eight. 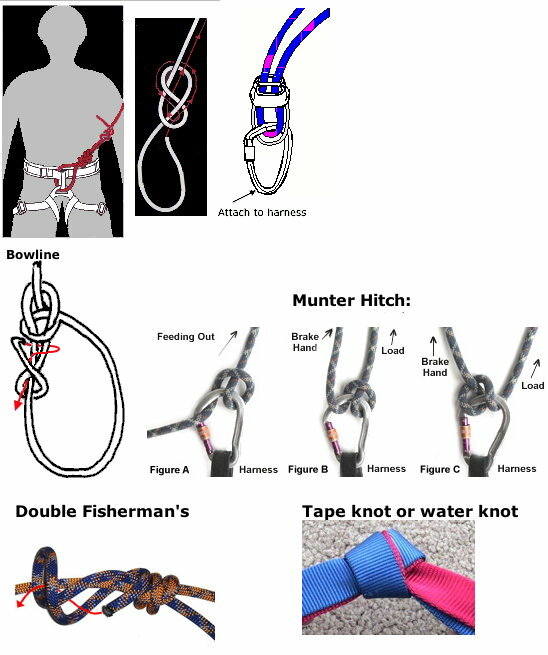 Tie a keeper knot with the 6 to 10 inch tail that sprouts out of the knot away from your body to stop the figure eight follow-through from unraveling while climbing. Perform a "hang test" by hanging from the rope; it should be comfortable. You should do this at home before going out the first time. * An exception is the Aspiring Harness, which has a stitched-through belay loop creating a higher centre of balance and therefore a more stable hanging position. You only attach to the top loop not the leg loops. A bowline is less bulky than a figure 8 knot and many people use it. 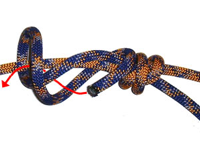 The double bowline is safer than the bowline, but the figure 8 is still the standard for tying in. 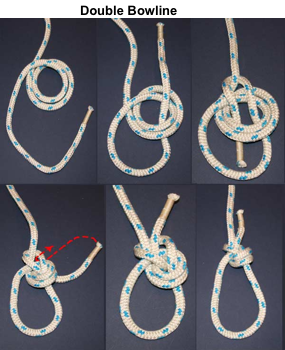 The bowline has a tendency to work loose, so it is important to tie a "stopper knot". A keeper knot is also common with a figure 8 knot. 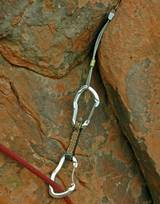 A Munter Hitch is used as an emergency rappel / belay device. Figure A: Here you're feeding out slack when belaying, or you're abseiling down. Figure B: To lock the Munter Hitch draw your brake hand up parallel with the load line. 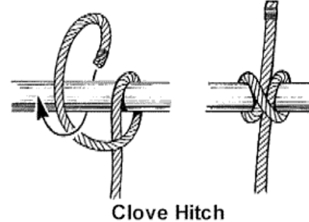 Figure C: The knot will correctly "flip" into this position as you take in slack when belaying. 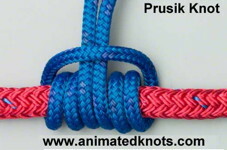 Sometimes a double overhand stopper knot is tied with the loose end. Stopper Knots are tied at the end of a rope to prevent the end from unraveling, slipping through another knot, or passing back through a hole, block or a device. Anchor Building Material: 3 21ft cordelettes. 1" tubular webbing or 7-8mm static cord. 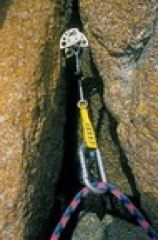 Belay Device: Auto-locking device is preferred for easy handling and safety. The skinnier the rope, the less durable and forgiving it's likely to be. Therefore, your first rope for top-roping and early lead climbs should be pretty beefy: say, something in the 10 to 10.5 mm range. It will put up with a lot of abuse, resist cutting over an edge, and probably last longer overall. A thicker rope will also work better in belay devices. Personal Kit: Harness, shoes, chalk bag, helmet. These usually go by trade names such as Stoppers, Hexcentrics or Friends or active (e.g., Cams or Spring Loaded Camming Devices [SLCDs] and some uses of tricams). They are much more fragile. To get a range from 0.5 to 1.5 in you need 2 SLCDs ($120), 3 Tri Cams (0.4-1.61") ($72), 3 Hexentrics (0.45-1.54") ($38) or 4 Stoppers ($40). Of course if you're leading a 5.10 the convenience of not having to fumble thru your rack to select the right size stopper is a plus. Plus cams are more versatile and easier to use. When placed in flaring cracks (cracks that get increasingly wider), SLCDs have been known to "walk" themselves out. Hexentrics are often a more secure option. A rack with a full set of tapers or hexes is not only lighter than one with the same number of spring-loaded cams, but it's less bulky. Plus, the pieces are less likely to get tangled. 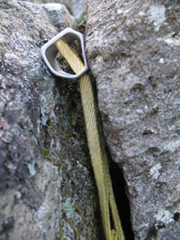 Occasionally a climber is forced to leave behind a piece or two of pro in order to back off a climb or to do an unexpected rappel. Most would rather leave a couple of $8 stoppers than a $60 spring-loaded camming device. * May not be available now. Protection components must be strong enough to avoid failure. For traditional climbing this means supporting a leader fall which can generate forces in the range of 8kN (1 kiloNewton = 225 lbs.). Impact force is determined by climber weight, fall distance and the length of time over which the fall is stopped. Lead climbing ropes (dynamic ropes) allow a certain amount of stretch to spread the force out over time. The impact force must not exceed 12 kN. The belayer will allow some slippage also, which also reduces the impact. The breaking force of the human body is 12 kN. It can tolerate higher forces for very short (fractions of a second) periods of time. American National Standards Institute (ANSI) and the American Society of Safety Engineers (ASSE) uses a Maximum arrest force (MAF) of KN as a standard. The amount of stretch depends on the total length of rope, climber weight and fall distance. Maximum allowed is 40%, most are around 30%. As a rope receives repeated falls it loses elasticity. 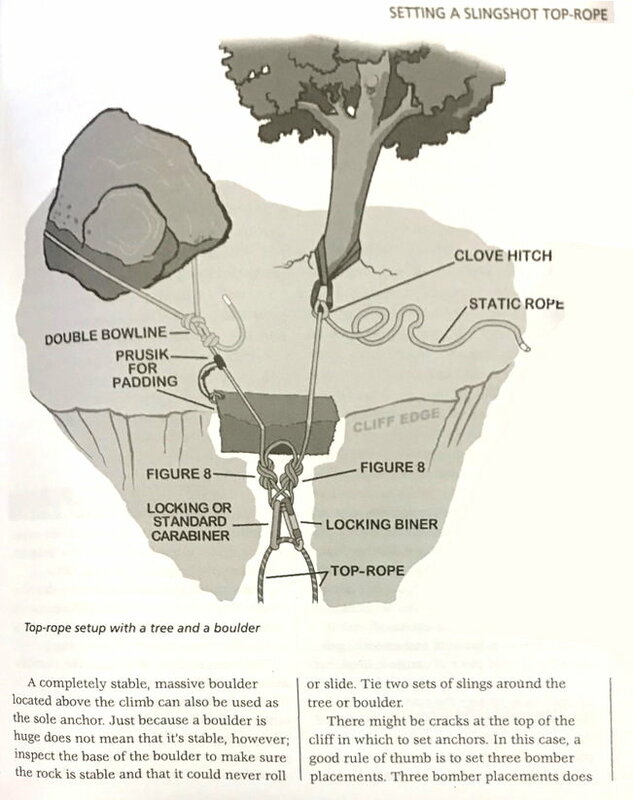 The fall factor f is the ratio of the height h a climber falls before the climber's rope begins to stretch and the rope length L.
In the diagram above a 80 kg (176 lb) climber 8 ft. above his last protection and with 24 ft of rope out (A fall factor of 0.67) will generate a force of 6 kN on a normal dynamic rope. The additional piece of protection between the belayer and rope going up adds friction which reduces the force on the belayer from 3.1 kN to 2.2 kN so the fall can be held statically. The Union Internationale Des Association D'Apinisme (UIAA) now CE (EU standards designation) provides a testing standard for climbing ropes. To pass the minimum requirements, ropes must not break after 5 test falls with 12 kN impact force. Fall ratings are governed by the UIAA (International Union of Alpine Associations) who issues standards that ropes must meet to become "CE" certified. Some standards. How far can you trust your belay device? 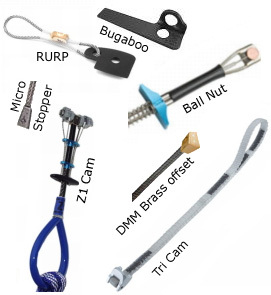 See Size Matters: A Gear Comparison : Articles : SummitPost for a complete list. ( Realized Ultimate Reality Piton) 1 1/16 (.0625) ? Knifeblade/Bugaboo piton 1 1/8 (.124) ? Note: Leader falls can generate forces in the range of 8kN, so these devices are not designed for this kind of protection unless used in combination. The above forces are for failure of the device; Bad placement or the condition or type of rock can cause failure with much lower forces. Camming devices "fail" regularly, but it's seldom the fault of the device. It's more likely due to haste, coupled with undeserved faith in technology. Plain old hardware nuts found by railroad.